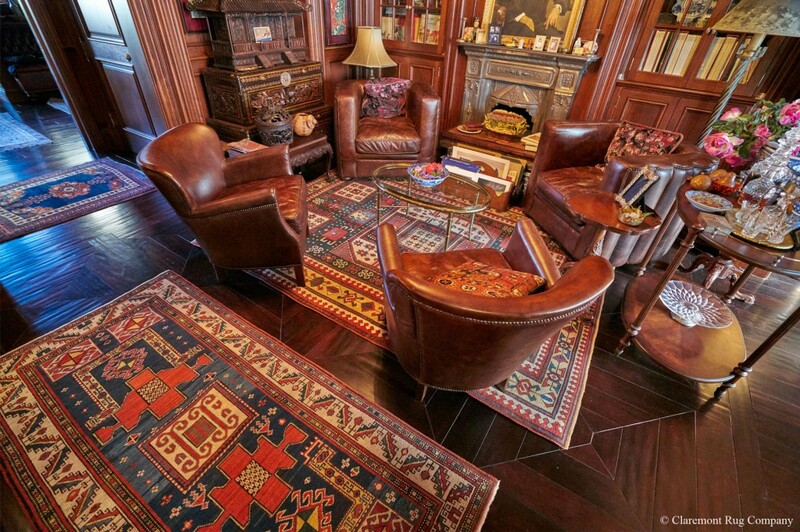 Click to read more about these Exceptional Caucasian Karachov Kazak Rugs in a client’s sitting room. 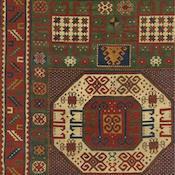 Virtually all Caucasian carpets are made with the symmetrical Turkish knot. 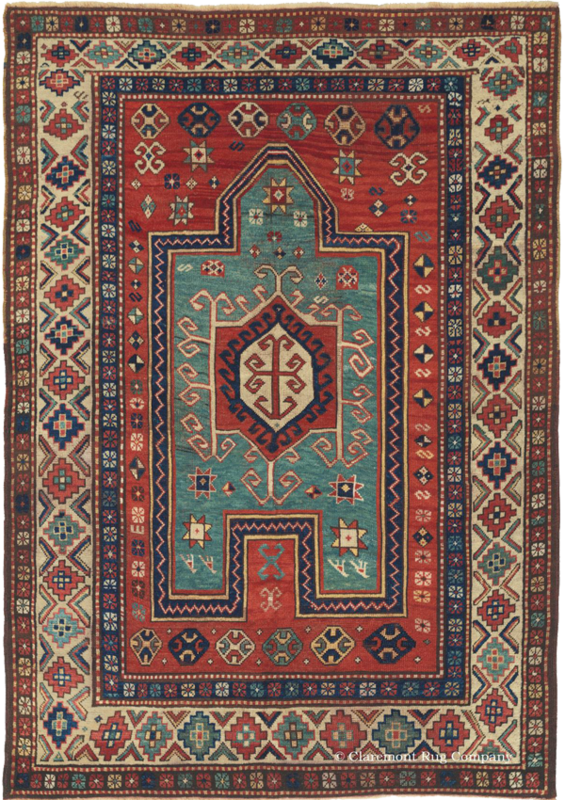 “Kazak” carpets are not from Kazakstan (which is on the opposite, eastern shore of the Caspian sea) but are from an area in what is now Armenia and Georgia. The word probably derives from the Russian for Cossack – originally Christian Russian and Ukrainian serfs who fled from feudal landlords, and were known as vicious warriors. 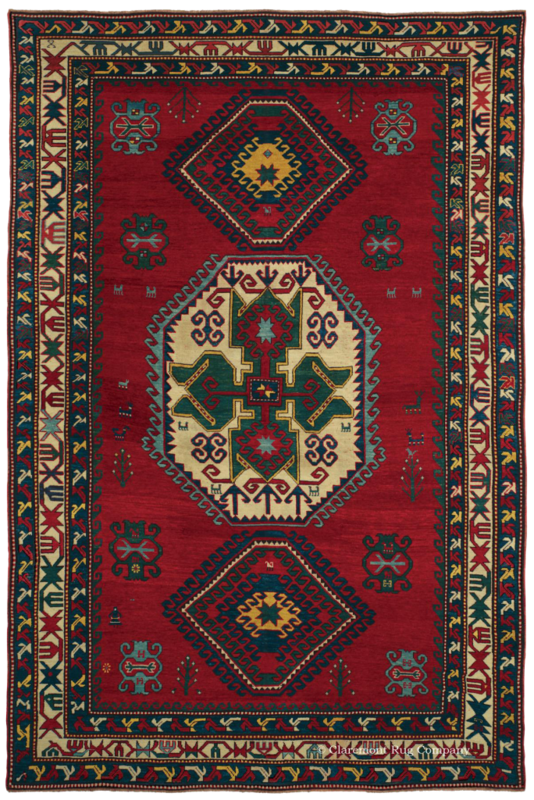 The colors of the best antique (100 years old or greater) Caucasian carpets were produced exclusively from natural materials found in the respective tribal regions, with the deep greens, vibrant yellows, and deep rose tones being the most precious. 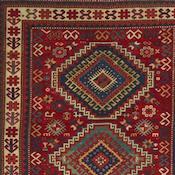 Most older Caucasian antique tribal carpets are “all wool” – not only the knotted pile, but the warp and weft threads are usually made from hand-spun woolen yarn or goat hair. 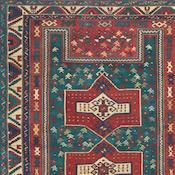 However, one can sometimes find older antique carpets (and, more frequently, in some newer examples) with cotton warps and wefts. 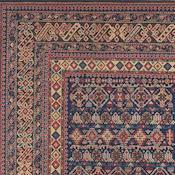 Shirvan region Oriental rugs are noted for their wool wrap threads, but are made with cotton weft threads and selvedges. 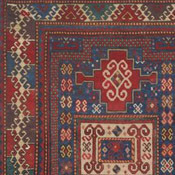 Weft threads can be different colors: rusty red/brown, blue, or white, although they are typically red in the Kazak district. 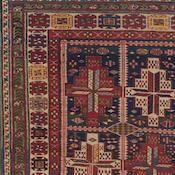 The number and colors of selvedges often can be an identifier to the area of origin. 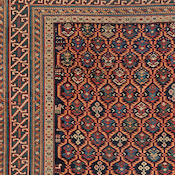 The designs and colors of antique Caucasian rugs are unique for two reasons: tradition – more deeply rooted in Asia than anywhere else, and the inherent geographic isolation.  White: either bleached or natural. Madder Red: from the root of the madder plant, can vary in shade of selected roots from light-orange-red to deep, rich reds or even to purple reds. Black: Brown wool dyed with indigo blue produces a lustrous black. A brittle and somewhat corrosive result is had from the concentration of tannic acid in the bark of the mountain ash, which oxidizes the wool over time. Brown: Walnut husks and volcanic soil are used to produce brown, which is enhanced by overdyeing in indigo. These dyes also contain tannic acid and will oxidize the wool, creating the common “sculpted” effect of many antique Caucasian rugs. Undyed brown sheep’s wool is also sometimes used. Indigo: By fermenting the blossoms of the indigo plant, liquor is produced that can be varied to give literally every shade of blue, from powder to midnight indigo. The length of immersion is the key. Cochineal: The female of the cochineal beetle produces a red dye that is processed by roasting and grinding, an expensive and prized dyestuff. Yellow: Pear leaves, chamomile, onion skins, turmeric, buckhorn berries, or almonds, often with pomegranate, are used to produce shades of yellow. Precious saffron is added in the best pieces to enhance the yellow tones. 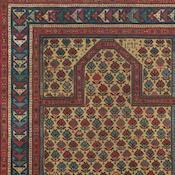 Green: Deep, clear greens were very difficult and time-consuming to procure, and when they are seen, are usually considered to be the sign of an especially masterfully dyed antique tribal rug. Most greens are obtained from first dyeing the wool with indigo blue, and then overdyeing it with a yellow dyestuff.